No explanations... Alright... I'm sick - no, really! I scrawled this out last night and did a dud scan of it, but you get the general idea. What WILL you think of next? You've given fresh a whole new meaning...or taken it to whole new level. Nicely drawn - very clever! Probably the best and most original image i've ever see you do. beautifully drawn and it has made me laugh! i hope you're a-okay now! 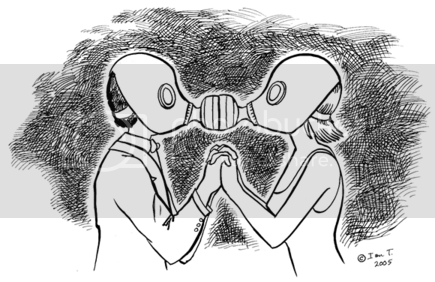 This actually made me think of some science fiction story about love in the contaminated future. Are there pleasure sensors inside their masks so they can enjoy the freshness of their kiss? This is a great illustration...very comic book like in its narrative vibe. And I love the crosshatched background! Fun concept, this really got my attention. This is a great, original take on the topic, perfect given your health. Feel better soon! This is brilliant! There are some boys who i have wanted to kiss in this way! There are some boys who i have wanted to kiss in this way! Thanks, Sam :). Er, maybe you shouldn't be kissing them at all in that case!